With over 24 years in the trade we are skilled, qualified and professional electricians that are available 24/7 in London and the Home Counties. When things go wrong, you want an electrician to act quickly as it can cost time and money. Anything can cause a problem with the electricity and the answer could be straight forward, but it could also be very dangerous. Until you are aware of the exact problem, it is always best to contact a qualified electrician to fix the problem safely. Damaged appliances, faulty fire alarms, lighting problems and power cuts are just come of the reasons of calling out a 24 hour electrician. You may be able to switch your circuits back on everything is working again but it does not identify the cause of the issue in the first place which could result in it happening again, potentially severe. Unfortunately, many commercial property’s have old wiring systems and while they do work well, they don’t meet modern safety standards. The difficulty comes when problems occur and the safety provisions in the old system are inadequate in keeping you and your employees safe taking risks with electrics; it is simply not worth it. Electrical safety needs to be taken seriously. When a problem occurs, the first thing to do is turn off your power at the main switch. This removes current from your system, and should render it temporarily safe. 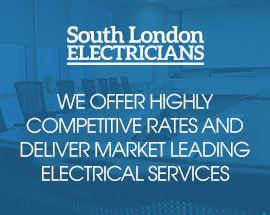 Next, call for South London Electricians. We can send you a qualified electrician 24 hours a day to find out what is causing the problem. We always endeavor to respond very quickly to customer emergency calls, and you have the peace of mind that your chosen trades person is qualified and up to the job.